We got an email Monday, letting us know what might be there. So we could plan. The final tally wasn’t far off. All of us got those. The boxes also had three items that may have varied from box to box. I swapped the rutabaga and parsnips. Partially because there was a bag of arugula in the swap box, and I dearly love arugula. And, I wanted more leeks to make a cauliflower leek soup. There were leeks in the swap box too. The swap box is a wonderful thing. Want to double up on something? Or, not feeling the love for an item. Swap it. Today, though, I was really enjoying the large amount of greens. 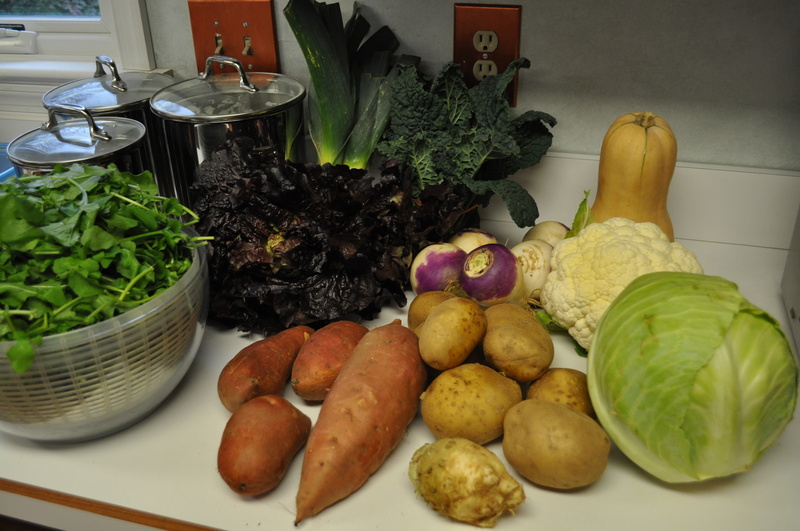 We are eating salads with lunch and dinner, so we go through quite a bit of greens. I just finished the last of the Love Dove Farms arugula, and had one head of salanova lettuce from last week left. 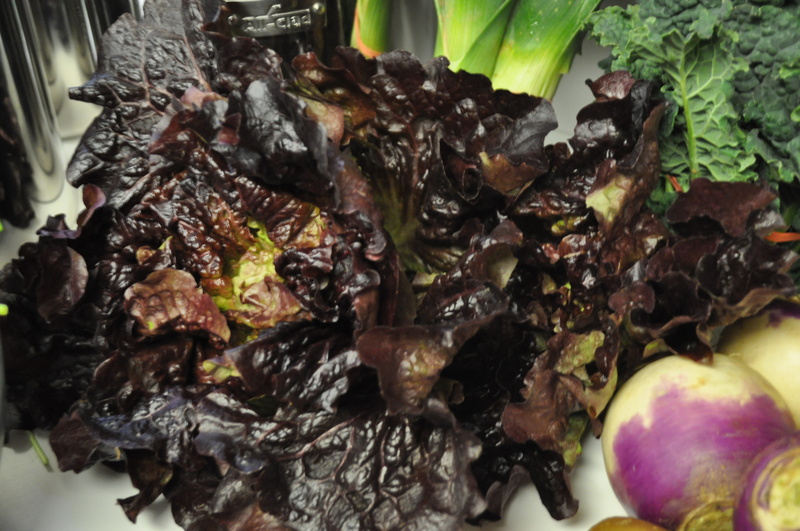 I really like the looks of the red leaf lettuce. 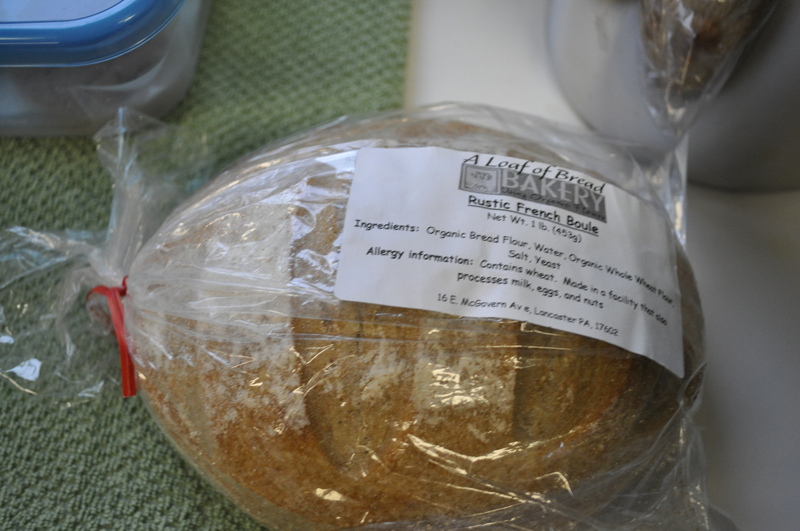 Besides these fresh veggies for the holidays, I got my weekly loaf of bread. This week it was a classic French boule. 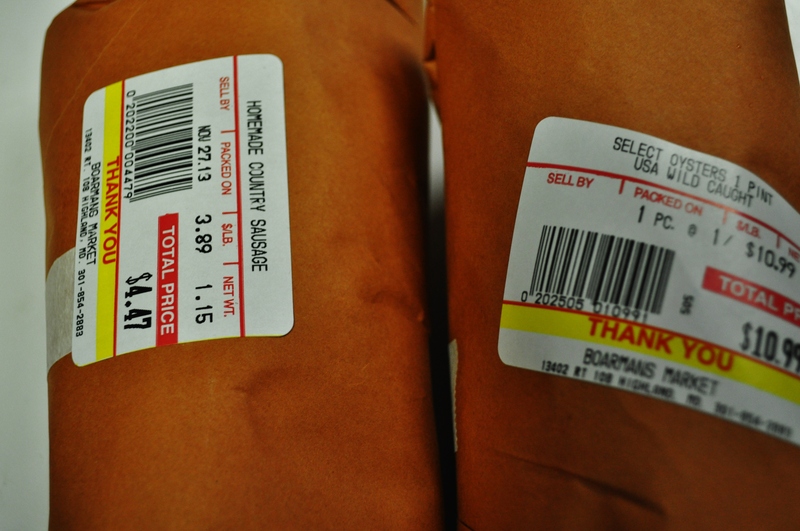 Before heading over to Columbia and the CSA site, I stopped in Boarman’s to get my Maple Lawn turkey, and my order of sausage and oysters. This will be a serious cooking weekend. Making an Oysters Rockefeller Casserole, and sausage dressing with my turkey. Friday night, our personal Thanksgiving dinner. You know, that dinner made with what you want to cook. Posted in CSA, Food, Local Businesses, Locavore, Real Food, Winter Eat Local and tagged cooking, CSA, farms, Food, foodie, local businesses, Locavore, real food, traditions. Bookmark the permalink. Is it any wonder that this is my favorite time of year? While partial to arugula and leeks, parsnips are just part of my being as are all those other gorgeous roots and greens and squash!